When he was eighteen years of age, John Greening queued at the British Museum to see the 1972 exhibition of relics from the tomb of Tutankhamun. He describes seeing his own youthful, “golden” face reflected in the museum glass cases as his “coming of age exhibition” (“The Treasures of Tutankhamun”). Part of his entrance fee went towards the UNESCO Nubia Campaign which relocated and restored invaluable historical monuments flooded in 1902 as a result of the Old Aswan Dam. One of these, the historical Temple of Isis at Philae, the “Pearl of Egypt”, later became a favourite visiting place for Greening and his wife. Greening delights in recording such connections. 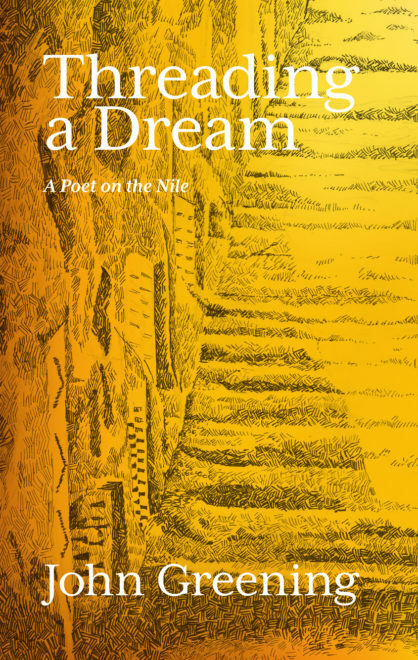 Threading a Dream is his memoir of the time he and his wife, Jane, spent in Aswan, Southern Egypt, working with the Voluntary Service Overseas. It was this experience which channelled his sensibilities into poetry and led to his 1982 debut collection “Westerners”. As a result of the construction of the new High Dam at Aswan, the Nubian people were displaced from their land and their beloved date palms, on which their livelihood depended. 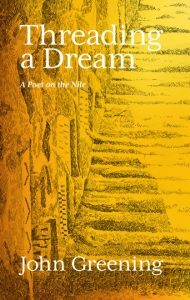 Dreams are not always fulfilled, as Greening makes clear – “The High Dam and Lake Nasser behind it were meant to bring electricity to the people. Instead, they brought liver disease and rain”. In Threading the Dream, Greening has given himself a wide remit. The reader benefits from the juxtaposition of materials from varying sources, including extracts from the writings of Florence Nightingale (who visited the region, as did many Victorians on Grand Tour), Howard Carter (who, along with Lord Carnarvon, excavated the Valley of the Kings) and Lord Edward Cecil (aide-de-camp to Lord Kitchener). Rosie Greening (one of John and Jane’s daughters) has illustrated the book with drawings which are meticulous, yet also seem to evoke the tenuous nature of reality. There is a wealth of detail and anecdote, recounted with humour and insight. As is the case with Greening’s poetry, this memoir, on the whole, does not does not tend towards the deeply personal but is a warm and generous account of the circumstances and experiences that continue to thread through the Greening family. Greening invokes that fine, perennial thread that runs vertically through all of our myths – ancient as well as present – informing and unravelling our notions of time, reality and survival.